Discription:This is actually a combination of two recipes.With your typical Maitre D’ Hotel sauce the fillets would be breaded and then dipped in the sauce, but instead we are brushing the fillets in the sauce and putting them on the grill. The best part is there’s a good chance you have all the ingredients in your home to make the sauce. 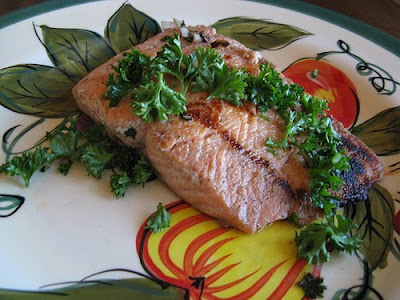 This recipe could be made with many different types of fish such as Bass or trout. This is a fast and easy fish recipe that everyone is sure to enjoy. Step 2: Brush your salmon fillets on both sides with the sauce. 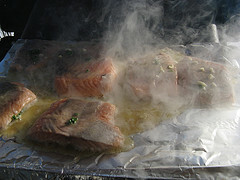 Step 3: Put fillets on the grill and cook until done (when the fillets flake easily). Garnish with minced fresh parsley.